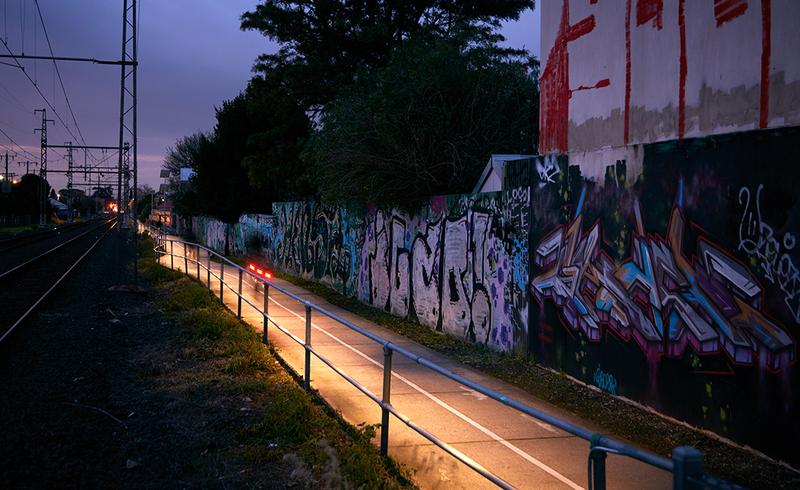 A great solution to a challenging problem that provides the right amount of light in the right place, with sustainable technology and no glare, providing a very useful service to cyclists and other pathway users. 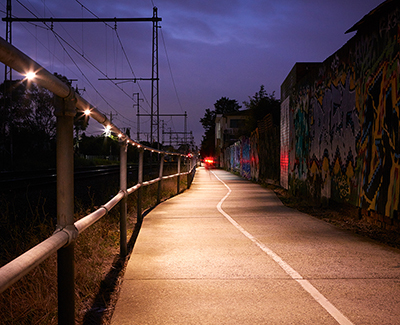 Lighting & Electrical Distributors have worked closely with Moreland City Council over a number of years to provide lighting solutions on various projects, Moreland City Council turned to Lighting & Electrical Distributors again to provide a solution for the Upfield bike/pedestrian path. 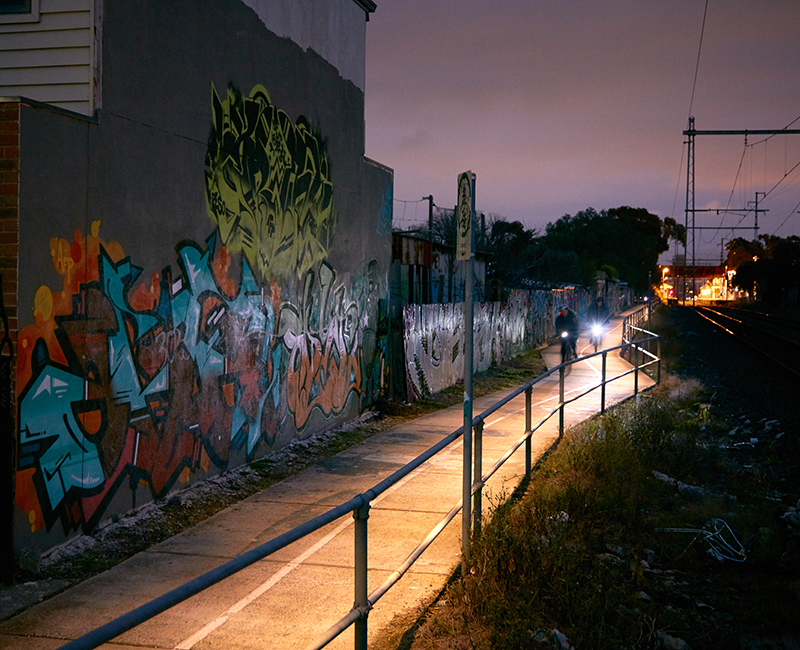 The path runs along the east side of the Upfield train line from Melbourne CBD heading north. 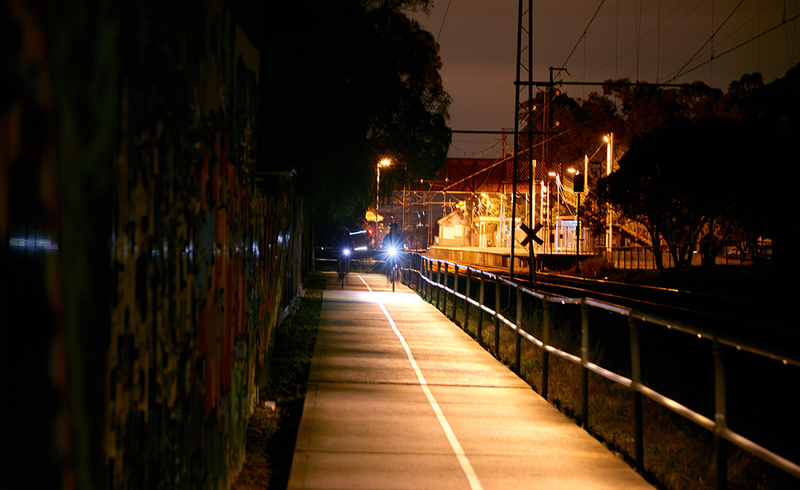 Moreland City Council were looking to illuminate a 500m section of the path, starting at Moreland station and heading north. The path has train tracks running down one side, separated by a handrail, and has residential properties to the other side. There were many limitations to consider in the brief. Spill light was a major concern, both onto the train tracks and into nearby residential windows. As a high percentage of the path users are bike riders, direct glare also had to be considered. The lighting solution works on both a practical and aesthetic level, while cleverly using and employing technologies that deliver a solution that is up-to-date in terms of its use now, whilst also setting a direction for the future. Remarkably effective cycling lighting that has become an example to be followed. Being mindful of luminaire mounting limitations, glare and spill lighting considerations, Lighting & Electrical Distributors proposed mounting lighting into the existing handrail between the path and the train tracks. Klik Systems had recently developed a new product called LEDPOD. The Klik Systems LEDPOD was designed to be mounted directly into handrail and other similar structures. Using the existing top rail, the electrical contractor cut a 25mm hole directly in the underside of the rail, at 1200mm centres, inserted the LEDPOD into the hole, and was then held in place securely by a retaining clip. All cables, wiring and drivers were small enough to be concealed within the rail. The Klik Systems LEDPOD is mounted directly on the underside of the rail, using an asymmetrical reflector/lens, it ensures the light is thrown down and across the path. There is no light thrown back onto the train tracks, or into neighbouring residential properties. Glare is not an issue, due to the mounting height and distribution. 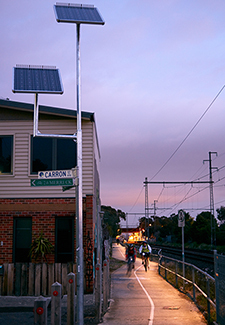 The Klik LEDPOD system runs off 5 solar panels by Leadsun Solar and at 0.9W per LEDPOD the total power consumption for the entire 500 metres of path is approx. 374.4W. Easy to install [no tooling required], this installation offered an excellent solution to the Councils brief and project requirements. The asymmetrical nature of the LEDPOD’s ensured a well-lit path, with excellent uniformity, and offers a much safer and pleasant journey, whether it be on foot or bike.